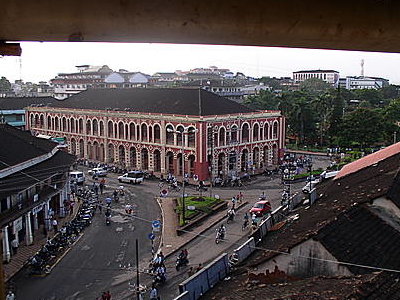 Margao is the second largest city by population and the commercial and cultural capital of the Indian state of Goa. It is the administrative headquarters of the Salcete taluka and the South Goa district. Margao in pre-Portuguese times was one of the important settlements in Salcete and known as Matha Grama (the village of Mathas) as it was a temple town with nine Mathas in temple schools. The Holy Spirit Church Margao was the first and only church to be built in Margão. Its replacement in 1579 was destroyed by raiders along with the seminary that had been built alongside it. The present church was built in 1675. Margao's importance as an administrative and commercial area grew with the increasing dependence of the surrounding towns and villages; leading to the administrative centre with the town hall at its centre being built in the south.The commercial market became attached to it and was hence called maud-gao or the market town of Goa, and since then the city has grown towards the east.In 1961, Goa was incorporated into the Indian Union, and Margao was declared as the administrative center of the district of South Goa. The nearest airport is Dabolim Airport which is 23 km away. The Margao Railway station is Goa's biggest and most important as it is a railway junction positioned at the intersection of the Konkan Railway and the South Western Railway. Most trains stop at Margao. Hence Margao is used more commonly as a transit stop rather than as a tourist destination by many people who either head off down south to Palolem (38 km) or to Benaulim and Colva which are about six kilometers away. The city hosts the test track for Skybus Metro,an elevated rail system which is patented by the Konkan Railway Corporation.The Skybus Metro project was later scrapped due to an accident which occurred during the test drive killing one engineer and a seriously injuring a crew of three.However, Mr B Rajaram who had invented the rail system has stated that in his opinion, the accident was avoidable. Margao is connected by road to other cities like Mangalore, Udupi, Bhatkal, Kumta, Karwar, Ratnagiri, and Mumbai through national highway 17(NH-17). Also there is road which connects Margao to Ponda and other towns of Goa state. Konkani is the most widely spoken language in Margao. Portuguese is still spoken and understood by a small number of people. 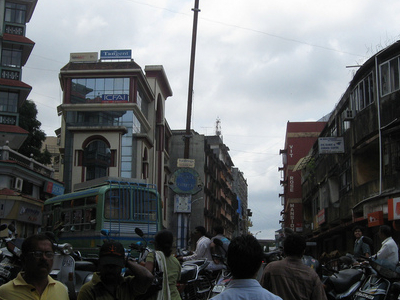 English, Marathi and Hindi are also spoken and understood by the city's population. The dialect of Konkani in South Goa is different from that spoken in North Goa. The city has many sights and destinations. These include the 'Closed' Market called, in the Portuguese language, Mercado de Afonso de Albuquerque or in Konkani as "Pimplapedd" or "Pimpalakatta," the municipal building (Câmara), the municipal garden, Anna Fonte (natural springs), Old Market or Mercado Velho, Holy Spirit Church, grand colonial mansions (especially the Seven Gables House near the church), the chapel at Monte Hill, the Hindu crematorium or 'Smashan' and the Muslim burial ground or 'Kabrasthan' both situated on Pajifond's Rua das Saudades.Some of the city suburbs include Pajifond, Aquem, Gogol, Borda, Malbhat, Kharebandh, Old Market, Navelim and Comba, the last two being the oldest parts of the city. Margao city hall: The city hall is situated in the heart of the city. 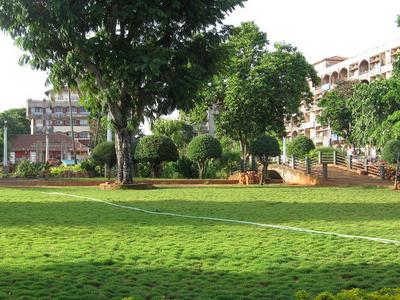 Margao municipal garden: The northern segment of the Margao municipal garden was developed by the Mavany family and is named after Aga Khan, during his visit just before Goa's liberation. The entire garden is now Municipal property and is maintained by the Margao Municipal Council. Narcinva D. Naik residence/Damodar Sal:Swami Vivekananda stayed in this house during his visit to Goa in October 1892.The mansion also houses Margao's well-known temple-hall "Dambaba Saal".Piple Katta Mandir (pedar) Near the New Market. The town is also known as the cultural capital of Goa. A cultural center named 'Ravindra Bhavan' was inaugurated by the Chief Minister of Goa, Digambar Kamat in July 2008 at Fatorda which is also an Official Venue For International Film Festival of India . It also has Goa's biggest sports stadium, the Nehru Stadium at Fatorda.Some of the theatres in Margao include the Gomant Vidya Niketan, OSIA Multiplex, Vishant and Lata; in addition to Goa's biggest theater, the Metropole.People from all over Goa congregate at the special market to buy spices and dried fish to be used during the oncoming rainy season.The usual specialities that are found in the cuisine of Goa are also to be found in Margao. The curry of Margao is a praised local speciality. Cans of curry of Margao are currently exported to Portugal and elsewhere.Margão is also the name of a brand of spices sold in Portugal. Here's the our members favorite photos of "Cities in Goa". Upload your photo of Madgaon!